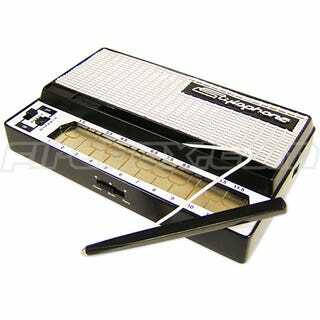 Rather like the kazoo, the Stylophone is what you might term a "musical" "instrument." The farty-bontempi sound was a feature of school playgrounds up and down the land—and even David Bowie used one on Space Oddity. And then, suddenly, rather like white dog poo, and "I choked Linda Lovelace" T-shirts, the Stylophone disappeared from view. Until now. And now it's back! From outer space! I'd love to say that it walked in here with that same look upon its face, but I would be a lying cow and you would all pay a midnight visit to Gawker HQ, flaming torches clutched in your paws, shouting, "Burn the witch." Ahem. Anyways, Stylophone. The 2008 version has two sockets, one for headphones, and one to connect your MP3 player to, which will enable you to really murder your favourite songs, as well as, for the first time, volume control and three different sound modes. Costing a smidgeon under $30, the Stylophone runs on three AA batteries and there are a schwazillion clips of people doing hot Stylophone action on YouTube.